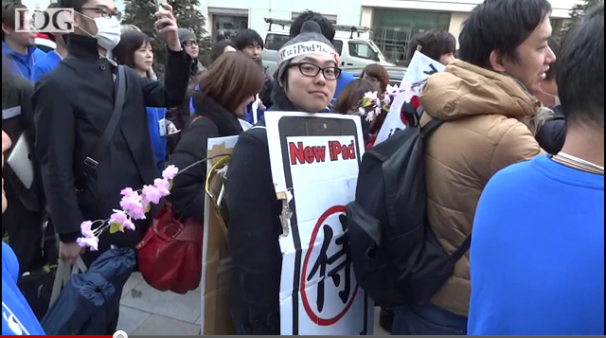 Hundreds lined up in Tokyo, some for a day and a half, for a chance to buy Apple's new iPad early Friday. At the company's store in the upscale Ginza shopping district, dozens of blue-shirted employees counted down the final seconds to 8 a.m. local time when sales began. A phalanx of reporters several rows deep crowded the main door as the first of over 400 shoppers streamed inside to buy the device, which is priced at ¥42,800 (US$515) for the cheapest model. Since the iPad 2 went on sale here in April of last year, dozens of rival tablets have launched, some by big-name Japanese companies like Sony and Toshiba. But none of these come close to generating the buzz -- or sales -- of the iPad, even in its third iteration. Ryo Watanabe, a 19-year-old university student, said he lined up 36 hours before the device went on sale so he could be the first to buy it at the Ginza store. He talked to reporters as he cradled his new 16GB Wi-Fi model, still in the box. "It's not that I like Apple itself so much, it's just that Apple makes good products, so I choose them," he said. Online preorders of the new device quickly sold out, and there is currently a wait period of several weeks for online orders. Apple made sure there was stock at its stores on launch day, though analysts have said the device's high-resolution screen is complicated to manufacture and may cause shortages for the company, which also happened after the iPad 2 launch. But those that lined up early Friday morning were in a festive mood, cheering as they entered the store, slapping hands with Apple staff and posing for the many photographers on hand. "It's an Apple festival!" said a girl who stood in line for hours with a banner that read "iPad Samurai".